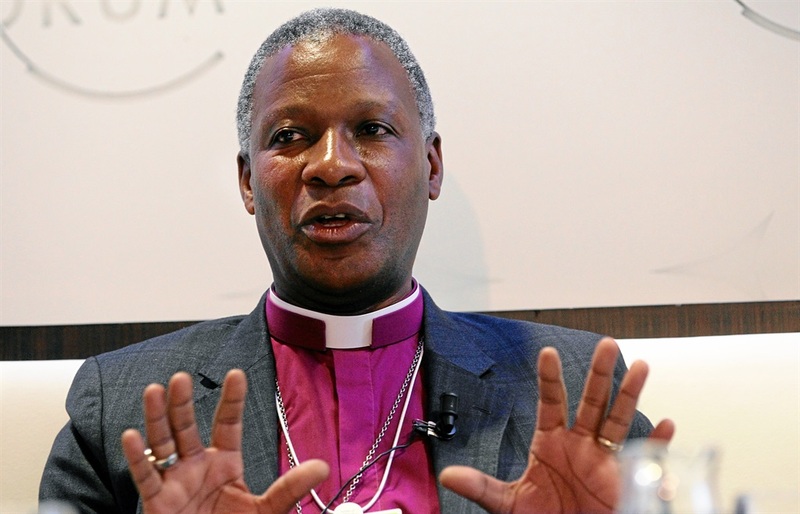 Cape Town - Archbishop Thabo Makgoba has called in his Christmas sermon for the new leadership of the ANC to act swiftly to remove President Jacob Zuma as head of state. "If Mr [Cyril] Ramaphosa wants the ANC to get a new lease of life, he and the new leadership will need to cut the umbilical cord which ties them to the Zuma era, quickly and decisively," Makgoba preached at the Midnight Mass in St George's Cathedral in Cape Town. Welcome. I’m so glad that you are here. What a challenging time of the year it is for us, here in South Africa, in 2017! It feels as if we are suffering from perpetual attacks of vertigo, but vertigo of the emotions, a feeling of dizziness where the ground under our feet seems to be rolling, shaking and moving. It’s like a daily emotional earthquake. I cannot look at the traditional manger scene against the backdrop of our current situation in South Africa, and not be deeply challenged. Consider the scene: a birthing place amidst animals, outside of the inn with its security and convenience; parents worn out by a long journey undertaken at the command of political powers; a land under occupation; shepherds who were ritually unclean and excluded from worship; swaddling bands as the poor were wont to use. I cannot look at this tableaux with its multiple symbols of exclusion and vulnerability and not be challenged by the harsh truth that the message of Christmas – the message of coming to new life in God, of fresh beginnings, of our growth in holiness – that the message of Christmas is not about having more but about being more. The crib, no matter how one looks at it, is always the place where Jesus takes on human misery. It is the place where the poor and marginalised find the possibility of hope that things might be different, that Emmanuel – “God-with-us” – is located in a stable, outside the spaces of power, amidst the clothes of the poor. Although this message of Christmas is never totally absent from our consciousness, so dangerous is it to the powerful and the comfortable that the Church often hides or stifles it. But Christmas is about breaking the yoke of oppression, allowing justice and peace to embrace us and enabling hope to shine in dark places, as the Advent readings have stubbornly reminded us. The controversy surrounding the private life of Deputy President Cyril Ramaphosa, who has confessed to an extra-marital affair in the past, and the response of an Eastern Cape student to receiving an erroneous payment of R14m, highlight the divisions in the way our nation addresses public and personal morality. Christmas redirects our thoughts, and challenges us to think differently, to dream bigger and to imagine more comprehensively. The poor and the broken, the people on the peripheries, look to us to help them realise their Bethlehem, their place of dreams, to put to flight the things that cheat them out of their true destinies and help keep alive the vision that Isaiah prophesied so tellingly, to bring about a new world. That is why Christmas is the appropriate moment to remind ourselves that anything that robs the poor of their dignity, that prevents them from realising their potential, that any act of corruption, no matter by whom it is carried out, is an act of theft from the poor, and that any infraction of the principles of good governance perpetuates the enslavement of the marginalised. Such acts make Christ’s new birth, and decent living, impossible. All through Advent the prophets have reminded us that the Coming Child challenges us to imagine the near impossible and, in the face of dire realities, to choose life. That is precisely why in recent weeks I have been challenging the leaders of our country to put the common good above all else. I have told the new ANC leadership that the faith community will support their efforts – but only on the strict condition that they must work together to re-establish values-based, ethical and moral leadership. A few nights ago, I watched the ANC's new leader, Cyril Ramaphosa, promise us that his party will be more responsive and more accountable to us, and that it will reach out to community organisations and other organs of civil society. Moreover, he told us that the ANC will act against corruption, collusion and other economic crimes, whether they be in the private or public sector. Most importantly, he told us that the people of South Africa want action, not words. Whether he acknowledges it or not, he knows and we know that means he has to act in the matter of President Zuma. He knows and we know that President Zuma and his cohorts of corruption have been behaving as if they own the South African Treasury. But they don't: the resources of the Treasury are the common property of all South Africans, to be deployed for the common good, not for the interests of a few. Shame on Mr Zuma for allowing people with dirty feet to walk through his mind and heart. And shame on his fellow leaders in the ANC for allowing him to get away with it until now. Christmas gives us a lens through which we can see each other, through which can see our neighbour and see God. Just as the birth of the Christ Child brings new life and the hope of new beginnings to our personal lives, it can bring hope to our corporate lives, even to the lives of political parties. But bringing new life into the world means cutting the umbilical cord immediately after birth. If Mr Ramaphosa wants the ANC to get a new lease of life, he and the new leadership will need to cut the umbilical cord which ties them to the Zuma era, quickly and decisively. Our economy is floundering, unemployment is rising and those cohorts of corruption who see they are losing influence are making ever more desperate attempts to loot what they can before their party is over. On top of that, the divisions in the ANC have led to a paralysis in decision-making and the implementation of policy. It is time to say, “Enough is enough”. I cannot see how two centres of power – one centred on the party and the other on the State – can collaborate when their values seem diametrically opposed to one another. I cannot see how the ANC will make a clean break with the past and set us on a new course unless the new leaders elected at NASREC last week, supported by their MPs in Parliament, act boldly and quickly to replace Mr Zuma as President of the country, and to follow that up with a carefully targeted Cabinet reshuffle. If they don't, we can see their fate written in the histories of other liberation movements in the world who have failed to adapt: they will lose power. No matter how bad things are in South Africa, each of us, each of you, have a choice. You can make things worse, or you can make things better. Paraphrasing what someone once said, you can't outwit fate by standing on the sidelines and placing little sidebets on the outcome of life. You have to play the game – if you don't play there is no way you can win. One way in which we can join the game is to join the debate on land and economic reform: the ANC's resolution supporting the expropriation of land without compensation cries out for the establishment – which I suggested from this pulpit last Christmas – of a kind of Codesa process to negotiate just, rational and broadly-accepted reforms on the ownership of land. Christmas remains the story of recognising God in unexpected places and naming God in the faces of those who occupy those places. A fortnight or so ago in an emotional meeting with Rohingya refugees in Bangladesh, Pope Francis told them that “the presence of God today is also called Rohingya.” In these words, he recaptured the ancient spiritual insight that the very act of “naming” challenges a culture of indifference. It gives to the poor and marginalised visibility and agency. He reminds us that for those who have had their rights trampled upon, and who have been denied the fruits of the earth–– that for them, naming is indeed a touch of new life. It is the Incarnation. Can we dare tonight to see South Africa through the eyes of the poor, and to name our country accordingly? On this holy night let us frame the Christmas story in the greater narrative of God’s presence in the poor, in those outside of the norm, in the discarded. Matthew, in the genealogy that prefaces the Nativity story, lists the generation of men who carried forward Israel’s chequered history but in Mt 1:16 there is a startling rupture of this male lineage, when he records that “Jacob was the father of Joseph, the husband of Mary, of whom Jesus was born, who is called the Messiah.” Matthew shows that it is Mary who provides the locus for God's promises to be manifest, for Israel’s hope to be restored. In that genealogy Mary is listed alongside Tamar, Rahab, Ruth and the wife of Uriah, women who are not the norm, who take risks, who love in the most unconventional ways. We often miss the place where God is birthing something new because like the Three Wise Men we instinctively go looking for God in the places of power, in the Courts of Herod when all the while God is stirring to life in a borrowed stable. But God names the unconventional, recognises them and honours them. God reminds us that it is those who shape history. Insignificant, illegitimate, defenceless, tabooed people are loved by God and God’s grace is in them. That is where God's love is being born. That is where the Christmas story continues. Joseph moved beyond his momentary confusion and fear and took Mary into his home, giving space for the nurture of this new initiative of God. The shepherds found tongues with which to worship and give testimony to God's presence in the world. We too are called to leave this manger with its symbols of exclusion and vulnerability and give witness through our service to the Lord's presence in ways that allow the poor and excluded to find words and deeds of hope. When we do this, then Christmas will have found a lasting echo in our world. Let me return to South Africa and what I have repeated over many years from this pulpit and Cathedral. After our liberation, too many of us folded our arms and waited for the government to fulfil our dreams. We didn't take lessons from other democracies; we didn't realise that good governments are there to create the environment in which we are guaranteed equality of opportunity, guaranteed the space in which we can get our hands dirty, do things for ourselves. God expects us to stand up, to speak up, to fight corruption and maladministration. We need a revolution in our thinking and our being, a revolution in which we use our numbers to promote moral and ethical values and to bring about the flourishing of all South Africans. Who doesn’t deserve equality in education? Who doesn’t deserve equality in service delivery? Who doesn’t deserve equality of access to clean water? Who doesn’t deserve the equality of excellent healthcare? Who doesn’t deserve the equality of opportunity? South Africa needs you. South Africa needs your voice. And most importantly, South Africa needs your collective action. We are fighting a New Struggle. The struggle for the equality of equality. A struggle for the equality of opportunity. We are in this fight together. We dream of a better South Africa. To dream by night is to escape from your life. To dream by day is to make it happen. God bless you. God bless your family. And God bless South Africa. God loves you… and so do I. Amen.